Old 35mm slides are an important cultural heritage that persists to this day. After all, the phrase “slide show” is now an integral part of practically all imaging software you can find on any operating system. However, for better or worse, those days of physical slide shows are long over and are not coming back. That leaves us with the problem of properly storing decades’ worth of slides, as they wait their transition to immortality via digitization. Slide – A transparency frame inserted into a slide mount, or in short – a mounted transparency. And transparency is simply a positive photographic image on a film medium, which can either be in color or black and white. Positive photographic images are processed with E-6 chemicals. Negative – Inversion of a positive image, where whites appear as blacks and blacks appear as whites. Negatives are processed with C-41 chemicals. When developed, negatives offer superior true-to-life coloring and contrast. Film – Is the physical medium for both negatives and positive photographic images. Film is made from a celluloid foundation covered with special photographic emulsion. Films can come in many sizes depending on their container: rolls, cassettes, cartridges, sheets, etc. It is understood that when something is on the film, it has already been developed, be it negatives, transparencies, or slides. 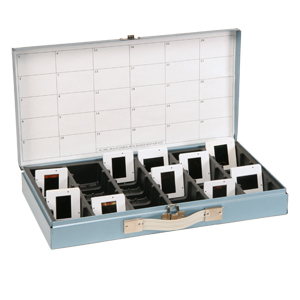 Coming from the Logan Electric company, which was considered a premium brand at the height of analogue film technology, this extremely robust metal (steel) storage box is archive-grade, sufficient for storing up to 750 2×2 35mm slides. The dimensions are: 36″ long, 18″ wide, and 2″ deep. You can move the dividers as you see fit. 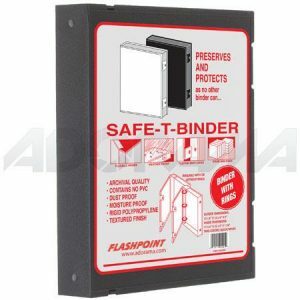 Two sturdy latches provide an excellent seal, although the box can only be opened upwards, which prevents vertical stacking. If that is not an issue for you, then you will be quite pleased with this storage box. However, there is another ‘double-decker’ version available which is 4” deep. The official storage capacity is stated at 750, but effectively you could easily place 130 slides per row, and with 6 rows that would get you an impressive 780 slides per box. 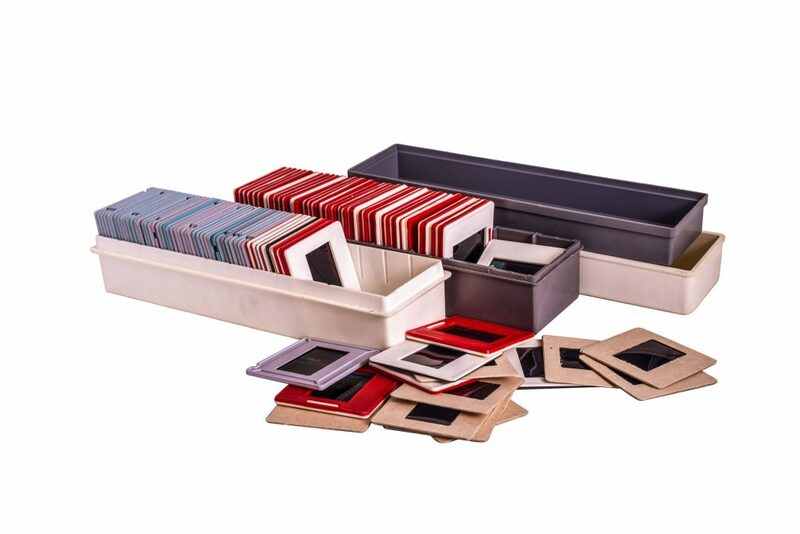 Storing slides inside a sturdy metal box is one thing, but if you want to have an easy access to individual slides while still making sure they are protected from the environment, then storage sleeve is an excellent solution. 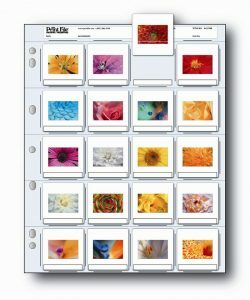 Print File 2×2-20B holds up to 20 2×2 35mm slides per sleeve, made out of 8 mil polypropylene which achieves the goal of a safe long term storage. For just above $10, you get 25 of these sleeves, totaling to capacity of 500 slides. If you are still in the process of selecting slides for digitization, sleeves are the best, as you can quickly visually inspect each individual slide on a sleeve. As we mentioned previously, when we talk about slides, we talk about transparencies, which are positive photographic images. When you mount them you get a slide. Although the most common slide format is 2×2 35mm, you should be aware of other sizes as well. Almost all of slides are 2×2, so when we further talk about slide formats we mean the size of the transparencies, not the size of the mounts themselves. The 35mm at 24mm x 36mm dimension has only one exception, called the half-frame slide, measuring at 18mm x 24mm. As for non-35mm slides, there are 126, 127, and 110 slides. Most of them are supported even by low to mid-range digital slide converters. Adorama offers a more universal and compact solution ideally suited for negatives, but also for important documentation, CDs, prints, and slides. Thanks to its rigid polypropylene it is highly resistant to moisture and dust, rated for archival-grade quality. The dimension of this binder box, with 1” O-rings, is 12.2 x 10.6 x 2.1 inches, weighing only 1.25 pounds. With one of these you can securely hold 9 by 11 sheets of negatives. The binder box is designed for storage only, so it doesn’t have a handle. Like with slides, sheets for negatives are a great solution when you are actively involved with your films, so you have clear, easy access to each strip. This particular one holds 7 35mm strips of 5 frames, totaling to 35 frames per sheet page. You can slide the strips from each side, which is super convenient. Furthermore, the strip rows are not hazy in the slightest, so their clarity allows you view the film without having to remove it and risk damaging it. 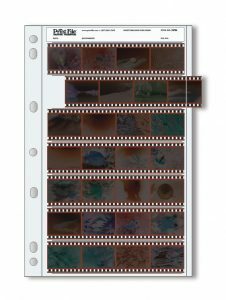 Film strip rows also offer continuous seams, so you will never find yourself in a situation where your film strip is stuck while sliding it out. Combined with a ring binder of your choice, the polyethylene sheet material is enough for this storage solution to be graded archival, in addition to being highly cost-effective at 100 packs – enough for 3500 film frames. Because they are mounted transparencies, slides are physically of the same format – 2×2, no matter if their transparencies vary in size. So, all of them can have universal storing solutions. Negatives come in film strips so they actually differ in sizes to be stored. They are of the same size as slide transparencies previously mentioned, with 35mm again being the most common format you will likely encounter. You could get a sheet sleeve for the largest one, the 126, so it would fit all other formats, but it would still be better if each strip snugly fits into each row, in order for it to avoid slipping out. Whether you intend to store your films, slides, and negatives for a couple of years as they are being digitized, or if you intend to store them indefinitely, the storage quality concern should be applied to both equally. But before you digitize, be sure to check out our 35mm slide scanner reviews to see our recommendations. And if it has just dawned on you that you improperly stored them all this time, there is no better time to rectify that than now with efficient and low-cost online stores.